Two very different vehicle presentations are set to take place, with Good Friday devoted to Italian cars and bikes while Easter Monday will only feature Supercars with around 100 vehicles on display. The free-to-attend event will also host a fantastic selection of Italian food, drink and themed entertainments on both days – which this year have been bolstered by Horsham District’s Year of Culture programme. Entertainers over the two days include English National Opera star Jo Appleby performing as a duet on Easter Monday, roving singers and accordion players and Hetty and the Jazzato Band as Monday’s bandstand finale. Responding to demand there will be an even greater range of Italian style street food, as well as the Italian partnership market by Simon Faro and Panino’s Giovanni’s Foods. Tastings of a range of Italian wines, aperitifs and liqueurs will take place at Carfax businesses; Panino’s, The Horsham Cellar and Carmela’s Deli. New for 2019, some of Horsham’s best known fashion and beauty stores will have a range of Piazza Italia inspired offers and experiences, including bath bomb making at the Little Luxuries Company, a free scarf with qualifying purchase in Gerry Weber and the exclusive Cadenza Cashmere range at Sienna Rocks - all in Swan Walk Shopping Centre. The Sporting Bears will return on both days, based in Brock Taylor, Market Square, giving Piazza visitors ride-out opportunities in some exciting cars in exchange for charity donations. Horsham Scooter Safety will add some variety at Piazza Italia by arranging a mobility scooter-manoeuvring course on The Forum. Members of the public will be encouraged to ride a scooter and help to spread the word about the safety sessions that are offered for scooter users. Horsham Piazza Italia always supports a number of charities through collections, activities and awareness building and 2019 is no exception, with five charities involved. Chestnut Tree House Children’s Hospice will be collecting on Friday, SERV Sussex will be at the evnt on Monday, The Children’s Trust will be promoting their June 1 Goodwood supercar event in Market Square on Monday, The Italian Job.com will be collecting on Friday and Horsham Rotary Easter Bunny Hunt Trail and Slot car racing will be in Swan Walk all Easter weekend. Following some early vehicle arrivals, Horsham Churches Together will stage its Walk of Witness from town churches to the 11.10am Good Friday service at the Carfax Bandstand. Always well-attended, the service brings home the story of Easter and offers a treat of hot cross buns for service goers. 2019 will also welcome Italian motorbikes and scooters in the Market Square and outside ASK Italian restaurant respectively. Alfa Romeo’s will have their own display in East Street with the ever popular classic FIAT 500’s taking up position on the Crown pub corner. A small display of FIAT coupes and Abarths is planned for the Forum alongside Benson’s funfair rides. On the Carfax, a new feature ‘Crates Classics’, will showcase a number of interesting vehicles including brace of rare vintage Lancia Dilambdas one of them built for The Maharaja of Mysore in 1929. No Horsham Piazza Italia is complete without event friends, The ItalianJob.Com, a charity for whom 2019 is a very special year. This is the charity’s 30th anniversary, the 60th anniversary of the first Mini and the 50th Anniversary of the iconic first film. 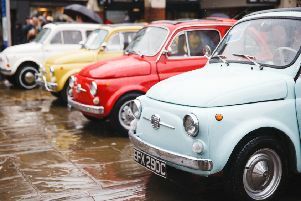 ‘The Jobbers’ who rally to or from Italy every year have raised over £2.5 million since 1990 for children’s causes, will bring their special brand of Mini mayhem to the Bishopric with parades through Carfax on the way in and out. The organisers are delighted that Horsham’s new Everyman cinema in Piries Place have chosen to support the The Jobbers with special screenings of the original film on Good Friday and Easter Monday afternoons. On Easter Monday, Premier GT are taking their involvement in Piazza Italia to the next level by booking in cars for every display location, East Street, Market Square, Bishopric and the Carfax as well as their own Parkside Race Paddock. A real first for Horsham, this eclectic mix of top car talent will make for a very exciting display. 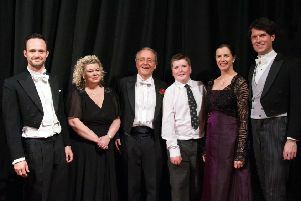 To find out more about the event visit www.horshamtimewellspent.co.uk or find Pizza Italia on Facebook.